FMCBC November e-news: The latest on Tetrahedron Provincial Park, Manning Park Donut Hole, 2019 Budget Consultation Report, and more! There's an opening on the FMCBC's Board of Directors! Looking for a great volunteer opportunity? Want to help shape the future of backcountry recreation in BC? We currently have an opening on our Board of Directors! The new member will be on the Board for the next seven or so months—through to June 2019 and the next AGM. And, it would be most helpful to the Fed if the new Board member could be from the Kamloops or Kootenays regions. That said, if any individual—rep or club member—would like to join the Board for the next few months to help out it would be greatly appreciated. If you have any questions or are interested in filling the vacancy, you can contact Barry at barry.janyk@mountainclubs.org. Click here for more information on this opportunity, including a description of the roles and responsibilies of FMCBC Directors. The Manning Park Donut Hole is a wild and unprotected area that is sandwiched between Manning and Skagit provincial parks. The region encompasses three main drainages—Smitheram, Silverdaisy and 26 Mile Creek—and is an important wildlife habitat. 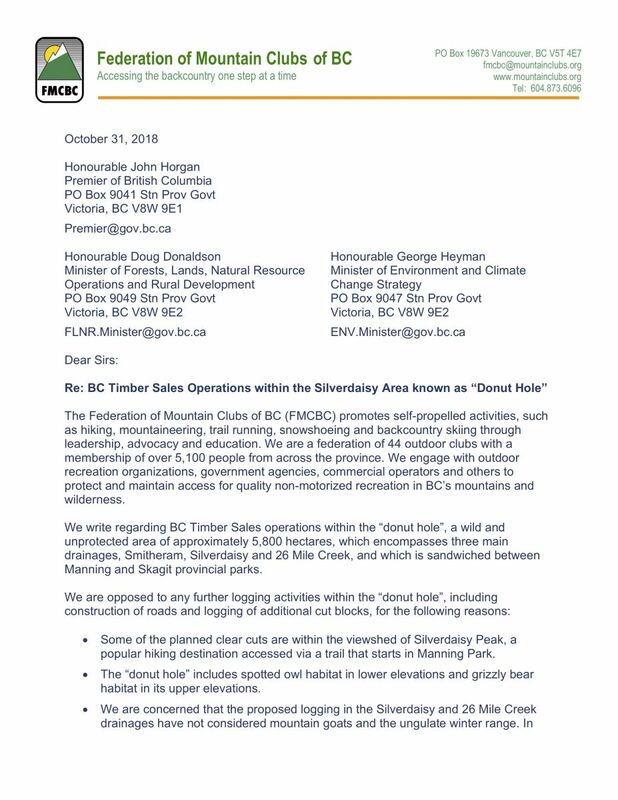 In our letter, which you can view here, we urge the government to instruct BC Timber Sales to cancel plans for further logging in the Donut Hole in the interest of maintaining the long-term goal of SEEC and BC Parks to incorporate the Donut Hole lands into our provincial park system. The two maps, referenced in the letter, were supplied by Paul Kubik and can be viewed here and here. The red/yellow striped areas show the locations of observed mountain goat tracks. 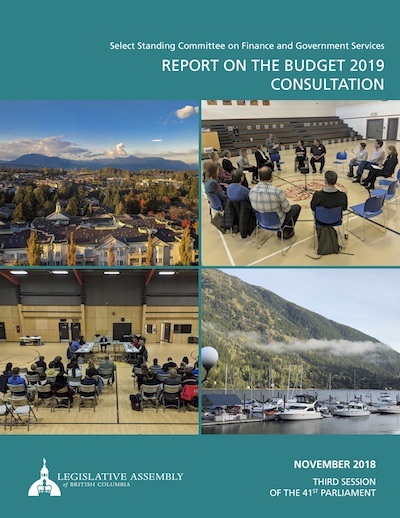 As Fed members are aware, the FMCBC provided a submission again this year to the Select Committee responsible for making recommendations regarding the 2019 provincial budget. Earlier in November, the recommendations were released in a report. And what did that report say, exactly? Click through to our blog to learn what the Committee had to say about BC Parks funding, and what we think of their recommendations. A big welcome to our newest member club, the Chetwynd Outdoors Society! Based in the beautiful Rocky Mountain foothills in northeastern BC, the COS is a small group of volunteers that started several years ago. Their focus has primarily been trails into the beautiful mountains surrounding their area, as well as restoring a fire lookout tower into a warming shelter. 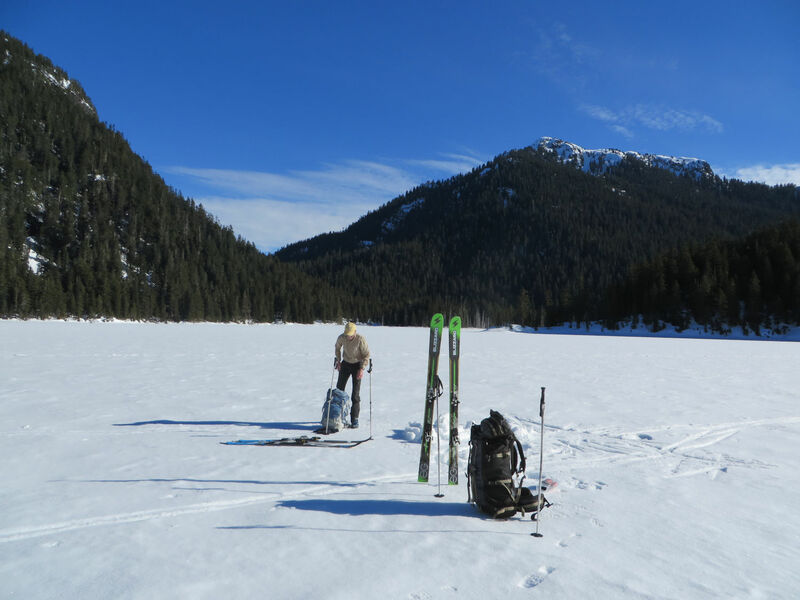 Currently, they are focusing on developing cross country ski trails on the outskirts of Chetwynd and dreaming of growing their pool of participants and volunteers to encourage outdoor exercise. Read more about the COS on their website. This past Tuesday was #GivingTuesday—an international day of charitable giving before the holiday season arrives. We thank each and everyone who has supported our organization. We couldn’t do what we do without you! You may not know that all donations made to the FMCBC go directly towards our Member Club Grants, which support projects initiated by our member clubs, such as trail work, bridge installations, hut upgrades, community events and more. It's a great way for organizations and individuals to give back to our trails and the outdoor recreation community. Click here to learn more about our Member Club Grant program. To make a donation, please visit our Canada Helps donation page. As a registered charity, we'll automatically isue you a tax receipt. The South Okanagan Trail Alliance, together with members of the Upper Carmi Resident's Association and local outdoor recreationalists, are actively working toward effecting change in BC Timber Sales' Carmi XC Rec. Trails Logging Plans. A petition has been created with more details on why this 'Intensive Recreation'-classified area, just 10 minutes from Penticton, should not be logged. BC Parks has prepared a draft management plan for Kalamalka Lake Provincial Park. Public comments will be accepted on the draft management plan until Jan. 31, 2019, and can either be submitted online or by mail. There will also be a public information session, hosted by BC Parks, in Vernon on Monday, December 10th. Learn more on BC Parks' Kalamalka Lake Provinical Park Management Planning page. 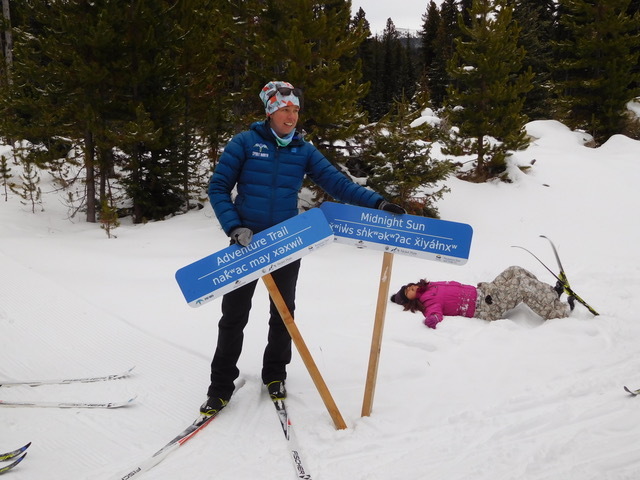 Nickel Plate Nordic Ski Centre recently unveiled bilingual signs, featuring English and the traditional Nsyilxcn language of Okanagan First Nations. The signage is a collaborative effort between the Sylix/Okanagan Nation, Spirit North and Nickel Plate and involved the translation of 30 ski trail names. You can read more about this excellent collaboration here. Thanks to Margaretha Hogeling of the Pentcton Outdoors Club for the photo. Just a quick reminder to those of you planning to head out to Rogers Pass in Glacier National Park this winter: The Winter Permit System is now in effect (as of Nov. 20, 2018). It is critical that anyone venturing into the backcountry in Rogers Pass be aware of and comply with the area’s Winter Permit System, for your safety and everyone else playing or travelling through the pass. Winter Permits are available at the Rogers Pass Discovery Centre. Also, check out the new interactive online map available at www.pc.gc.ca/skirogerspass. This tool provides real time access to daily updates on what areas are open or closed, avalanche forecasts, live webcams, and it can even show your location on GPS-enabled devices. Have you checked out NatureKids BC? They have tons of province-wide programs that encourage kids (and their families!) to get out on the trails, learn about the outdoor world, and develop a deeper appreciation for nature and the need to protect it. ACC National is looking to hire a Mountain Adventures Coordinator. More details. Our Vanishing Glaciers: The Snows of Yesteryear and the Future Climate of the Mountain West (Rocky Mountain Books, 2017) by Robert William Sandford has won the 2018 Lane Anderson Award for science writing. Mike Nash of the Caledonia Ramblers reviewed the book in the Fall/Winter 2017 issue of Cloudburst, which you can find here. An audit of A&A Trading Ltd. and Terminal Forest Products Ltd. on forest licence A19229 (Sunshine Coast) has found both companies met the requirements of the Forest and Range Practices Act and the Wildfire Act, according to a Forest Practices Board report. Thanks to Victoria Lam of the Chetwynd Outdoors Society for this month's feature photo, which was taken on the outskirts of Chetwynd, hiking down from Ghost Mountain to Mount Baldy. It is a beautiful hike, and used all year round by Chetwynd residents for hiking, mountain biking, snowshoeing and sledding.